I’m working like crazy on a new book and have 8 slow cookers going at once. I love it but it can get a little exhausting! Also it means I have dinner working, but we still need to eat lunch. Today I’m making my favorite quick and easy dish, Broccoli with Spicy Garlic Sauce. 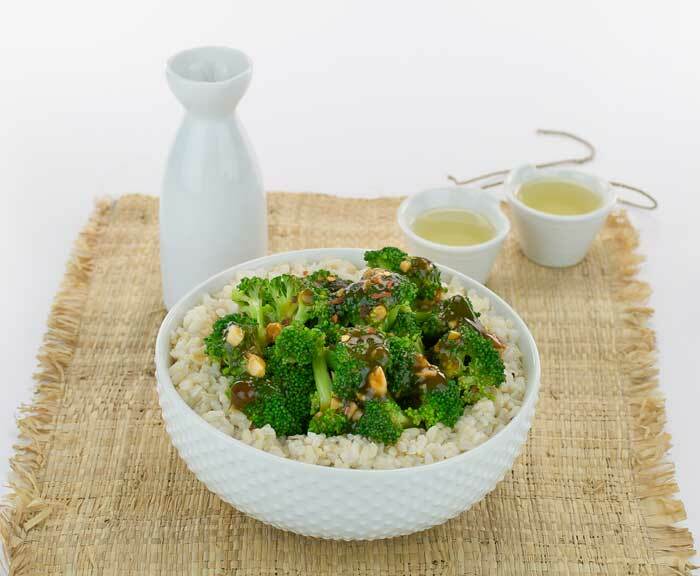 For this Quick and Easy Vegan Broccoli with Spicy Garlic Sauce Recipe, you can make the garlic sauce in the morning and even prepare the broccoli the night before if you want. If you are using frozen broccoli, you can even thaw it out in the fridge to speed up dinner a little more. Just think about it, once the sauce is made, you only have to deal with 2 other ingredients when you come home! , a ton this season. One of my favorite chapters is the Speedy Stir-frys. 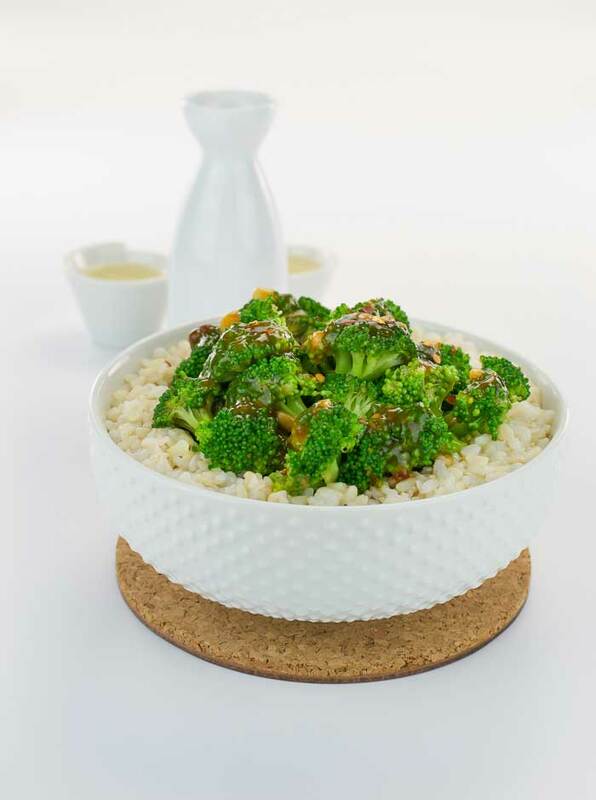 This Quick and Easy Vegan Broccoli with Spicy Garlic Sauce Recipe is from it, as well as Orange Ginger Cauliflower, Pepper Portabella, Szechuan Eggplant and Ann Oliverio’s Vegetable Fried Rice with Tofu. Mix the sauce ingredients in a measuring cup and set aside. Heat the oil (***or water) in a wok or large saute pan over medium-high heat. Mix in all but 2 tablespoons of the sauce. Then stir the cornstarch into the leftover sauce until there are no lumps then add that to the pan. Cook until the sauce thickens, about 3 to 5 minutes. Serve over rice. If you like yours extra-saucy go ahead and make a double batch of the sauce. Also, try making this with thin Japanese eggplant cut into strips or even with a mix of veggies and tofu cubes. Mix in all but 2 tablespoons of the sauce. Then stir the cornstarch into the leftover sauce until there are no lumps then add that to the pan. Cook until the sauce thickens, about 3 to 5 minutes. The sauce looks yummy and versatile. How long does it last in the fridge? I’ve never kept it for long, but I think up to 3 days at least. Broccoli with garlic sauce is one of my favorites, too. Your version looks so much better than the local Chinese restaurant’s does! Ooh this looks so good! I love broccoli with garlic sauce and totally order it whenever we get delivery. Now I can save a buck! oooh, that garlic sauce sounds fantastic. I love broccoli – saving this one to make soon! Just made and ate this -delicious! I’m not fond of cooked broccoli but eat it because it’s good for me. But smothered in this spicy, garlicky sauce it’s great! I added capsicum and mushrooms for extra veggie goodness. Tried this today and it was delicious! This is my favorite Chinese delivery dish and thrilled to be able to make it myself now! I made this last night, and it was excellent! I added mushrooms and soy curls, and I’ll definitely be making it again soon. Thanks for the great recipe! I made this last night and added squash and zucchini. It was great. It was so good, I made more for my bf to take to work for lunch. I will definitely make again and invite my non-vegan friends over for dinner. ???? I’ve made this 3 times in the last couple weeks! My boyfriend claims, “This is the best sauce of all time.” 🙂 We usually add a little extra maple syrup so it’s sweeter! This was delicious! Directions are a little unclear, though. First step is to mix all of the sauce ingredients together, so I added the vegetable oil to the sauce. Second step is to sautée broccoli with the oil 🙂 Maybe others caught this by reading ahead, but I wanted to flag it just in case. That aside, this is a great recipe and we will definitely be making again. Made this last night and it was really good! Might add a little more maple syrup next time, just to make it a little sweeter for my taste, but it was amazing! I can’t wait to make it again. My new favorite recipe! I added baked tofu, but otherwise stuck to the recipe as written, and the sauce was amazing! Thanks for the post! 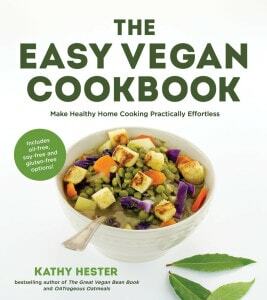 Made this tonight–so easy and so good! I doubled the sauce and added sliced mushrooms and ham-flavored seitan. Even the meat-eaters in my house wanted seconds! Will definitely make again. The sauce ingredients don’t seem to be listed anymore, only oil, broccoli and cornstarch. Maybe they could be added back on? I’m not seeing the sauce recipe anywhere, help! Made this last night for an easy dinner. It was delicious!!! I will definitely make it again and use it with tofu as well as another person posted. Just stumbled on this site but will be taking a closer look today. Thank you. Just one note: In the recipe towards the top of the page (on my phone, I see the same recipe twice…I guess the second is showing it as it’s listed in the book…? ), it includes the olive oil under the sauce ingredients, but it should be under the non-sauce ingredients as shown in the 2nd recipe.